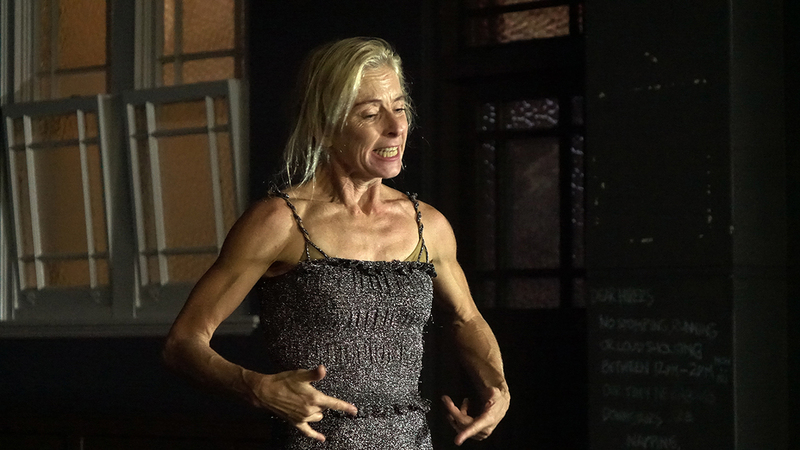 In three gripping performances artists embodied strangely mutating personae, intriguing their audience in the intimate Readymade Works studio in Sydney’s inner city Ultimo. Curator Julie-Anne Long (and Co-director with Sam Chester of the space) programmed highly experienced artists, feeling, as many of us have, she’d been deprived of seeing them in performance of late: Martin del Amo and Anton, Kathy Cogill, and Nikki Heywood and Tony Osborne (read about the artists and their extensive careers here) . Anton, performing a segment from ARENA, a collaboration-in-progress with choreographer Martin del Amo, conjures a series of disparate characters, at first largely verbally and then by building distinctive bodies with specific trajectories, each returned to in a whirlwind of exacting movement — including a wild horse ride. The next stage in the work’s evolution, said del Amo in his introduction, will unfold startling connections between the characters. In the meantime, Anton delivers superb comic timing and deft characterisations while del Amo’s shaping of the idiosyncratic movement recalls his own solos in which quite lateral dance springs out of walking. I long to see the completed work. In the delightfully perplexing The Levitation Act, Kathy Cogill traverses a variety of states of being, first quivering and glittering, folding deep down into herself, seemingly earth-bound, and subsequently manifesting as an agitated, declamatory French speaker, and then a mysterious trench-coated figure unloading a swathe of material and small objects. Somewhere in the mix is a lyrical passage of Strine and finally a brief sinuous duet in which, on her back, Cogill lifts her willowy daughter Clara Louw with elegant ease. It’s as if having progressed from the inability to leave the ground in the piece’s opening Cogill is now lovingly enabling the girl’s dancerly levitation. If fragmentary, the work has a kind of cogency wrought, like Anton’s, by charisma and felicitous movement. 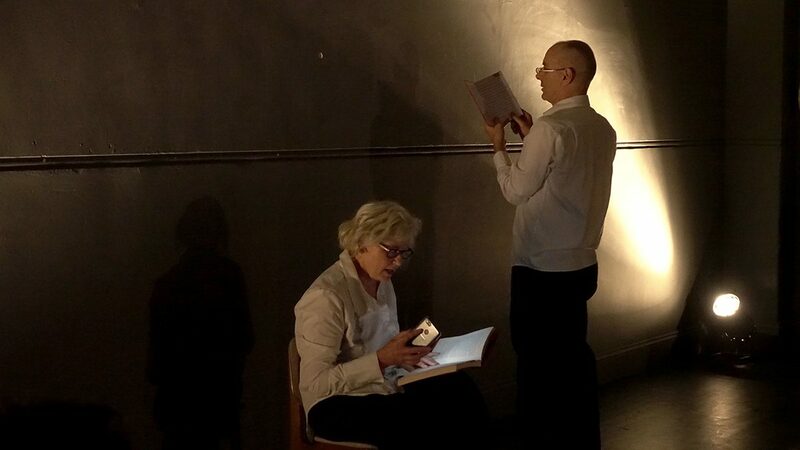 In the engagingly enigmatic Sound & Its Double, “a spoken sound dance duet” performed in traverse, a Beckettian Nikki Heywood and Tony Osborne gather up and select from piles of seemingly identical books in bright red covers. The couple, close to but facing away from each other, angle the books as they bend towards limited light, muttering urgently and incoherently from the pages with a seemingly incidental musicality. When seated opposite each other, the books gradually set aside, it’s as if whatever was sought in the couple’s mouthings has not been found and a danced and raw vocalised hostility ensues, erupting against the self, against the other. Perhaps it’s cathartic: the couple find brighter light with which to read and, though seemingly oblivious to the other, their words make limited sense, the lyrical duet of alternations and overlaps suggesting a state of being at once together and apart. With further development Sound & Its Double could make a welcome return. This showing was the first Happy Hour of three this year in a Sydney desperate for independent dance opportunities, for artists and audiences alike. The impressive list of artists who presented last year includes Timothy Ohl, Benjamin Hancock, Rosie Dennis, Raghav Handa, Sara Black, Lucky Lartey, Vicki Van Hout and Matt Cornell, and Heidrun Löhr and Hans Bildstein. Happy Hour is an admirable venture, bolstering a challenged Sydney dance ecology, remunerating artists and welcoming audiences with affordable ticket prices and access to artists. There should be more of it.